Buy 10 A3 GoGlobal International Courier cardboard satchels to send your letters and documents overseas with our International Courier service. 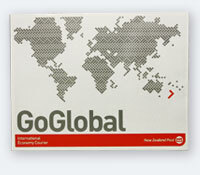 For New Zealand Post Business Account holders only. Overnight orders need to be received before 12 noon Monday - Thursday to be delivered on time. Orders placed on Friday will be delivered on the following Monday.